As the cardboard house and Christmas present have shown, I tend to take a simple idea and go a little overboard with it. (Okay, let's be honest, way overboard). This month's out-of-hand project was a complete redesign of the playroom. As soon as she began walking, our daughter started taking over the living room. To contain the chaos in a room with a closable door, husband and I converted our office into a playroom. Which basically meant just taking our stuff out and putting her stuff in. Until recently the room donned blue-green walls and plain white curtains that the previous owners left to us. I have been itching to redo it for some time. So... I thought the first step would be to upgrade the storage in the room; a small Rubbermaid tub as a toy-box and bookshelves is fine for a toddler with teething toys and blocks, but not-so-much for a little girl with art supplies, puzzles and dress up clothes. 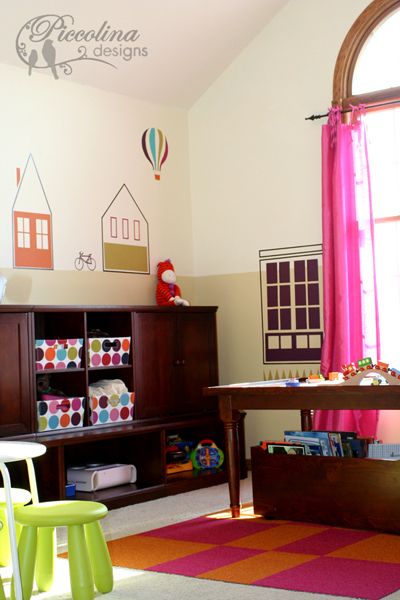 Being the designer I am, I didn't feel just an accent wall would be fun enough for a play room. I mean, this was my opportunity to go crazy with a room! So I started playing with options in Photoshop. I drew my color palette from the Target Itso Polka Dot bins (love, love, love them), and my first renderings played with the idea of oversized dots on the wall. Then I looked at some options of vinyl wall decals. When I saw this Ohdeeoh room tour with the city skyline, it reminded me how much I adore the illustrations of Laura Ljungvist. Paint Swatches and Laura Ljungvist books. I sketched up elevations of the walls and begin painting. This is just a sneak-peek photo. I am still working on the long wall cityscape, and some finishing touches in other areas. To be continued! aaaaaaand another addition to Odeeoh! This is FANTASTIC!!! Love, love it. Can't wait to see the finished product.